A delicious meal is not complete without a dessert. 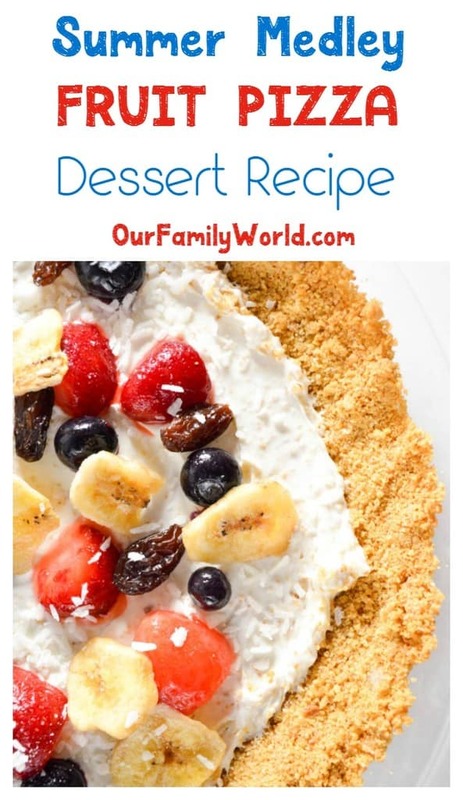 My kids and I have a sweet tooth, and we are always craving dessert after our meal. I usually have a pound cake or some coconut cookies to satisfy those cravings but during the hot summer days, I don’t feel like eating these. 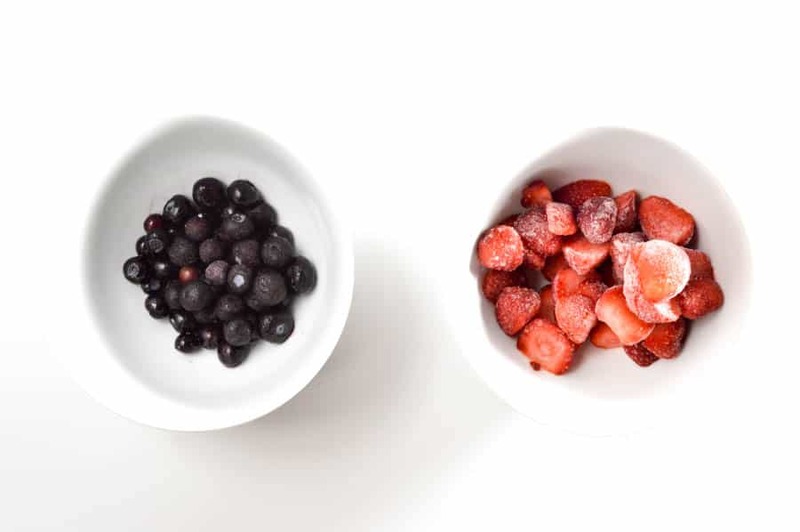 I love experimenting with fresh fruits that we don’t get the chance to eat during the winter time! That’s one of the downsides of living up north: we don’t have fresh produce during those cold winter times! So as soon as the hot weather hits and my farmer’s market opens, I make sure to stock up on those fresh items! Food tastes so much better! While my kids love ice cream (like this blueberry ice cream recipe) and popsicles, I wanted to try a different summer dessert idea. As usual, Pinterest was my inspiration, and I stumbled on those delicious and mouthwatering fruit pizza. I was drooling just looking at them. So I decided to give it a try! And let me tell you, I was missing out on something delicious. I wish I made this dessert before! The fresh fruits combined with dried ones adds such a delicious taste and crunch to the dessert! It is refreshing and satisfying without leaving you feeling stuffed. You don’t want to have a heavy dessert during those hot summer days! It also makes a perfect dessert for any upcoming party or a hostess gift! Now let’s see how you can make this easy dessert. Have you ever made a fruit pizza before? What do you put on yours? I used blueberries, dried bananas, fresh strawberries and dried cranberries. Combine all ingredients until you get a sticky consistency. Put the dough in a glass pie pan and using your fingers, press until tightly packed evenly throughout. Bake at 350 for about 10-13 minutes. Let cool completely. Using an electric mixer, combine all ingredients at medium speed and work your way up to high. If icing too stiff, add milk one tablespoon at a time. If too watery, add icing sugar 1 tablespoon at a time. 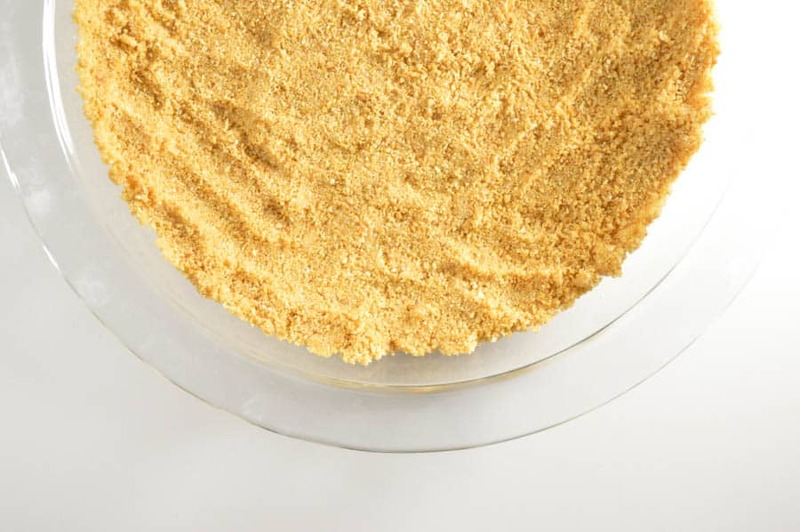 Once your graham cracker crust is cool, slather on your favorite recipe for buttercream icing (this will act as your pizza sauce). Use an offset spatula to spread a thin layer evenly throughout your “pizza crust”. Top with your favorite fresh and dried fruit. Don’t forget to top it off with some delicious “cheese” (coconut flakes). I used blueberries dried bananas, fresh strawberries and dried cranberries. Use an offset spatula to spread a thin layer evenly throughout your "pizza crust". Top with your favorite fresh and dried fruit. Don't forget to top it off with some delicious "cheese" (coconut flakes). 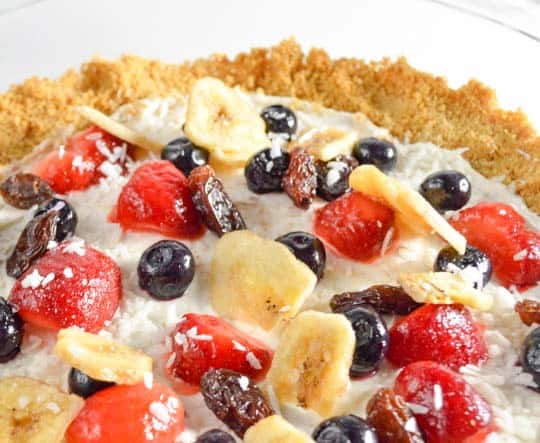 The beautiful thing about this fruit pizza recipe: you can use any fruits you’d like! Just like a regular pizza, you can even go half and half with the fruits. Or, if you want to turn it into a fun party activity, make the crust, spread on the “sauce,” then set out all sorts of different fruits and let party guests add their own toppings. Craving more yummy summer desserts? never tried a fruit pizza before and can’t wait to try this. Oh my …..this looks fabulous. Thanks for sharing at the #HomeMattersParty this week. Looks absolutely amazing! Thanks for sharing with the Delicious Dishes Recipe party this week! I love fruit pizza! I prefer it with lots of berries, but just about any fruit would be delicious. I like the fruit pizza. These are perfect for dessert, especially when guests are over! I keep saying I’m going to try to make my own pizzas and I never do. However, this looks really refreshing for summer and healthy! Mmmm…it reminds me of a fruit flan! It is perfect for the summer. I love veggie pizza and this looks like it would be even better. 🙂 I’m sure my family would go crazy for fruit pizza. I need to make it for them sometime soon. This is a fantastic dessert idea. I will have to get the ingredients i need to make this tomorrow. I’ve never made a dessert pizza before but sure do like eating them. I’m glad it also has healthy ingredients so I don’t feel so guilty. 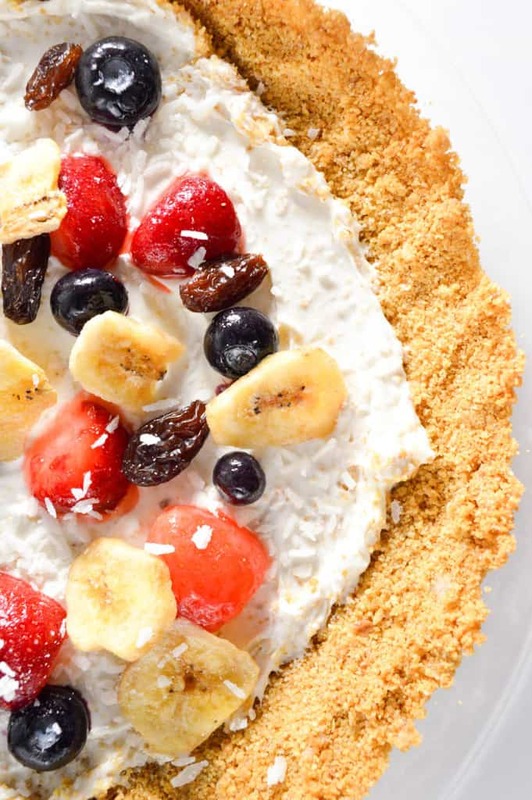 What a healthier way to make pizza, love the idea of a fruit pizza dessert! My kids inherited my sweet tooth! I’m trying to cut us all back on our treats and make healthier swaps. This sounds perfect! Fruit pizza is such a delicious dessert in the summer. We usually make ours with sugar cookie bottom, but I must try your version soon! 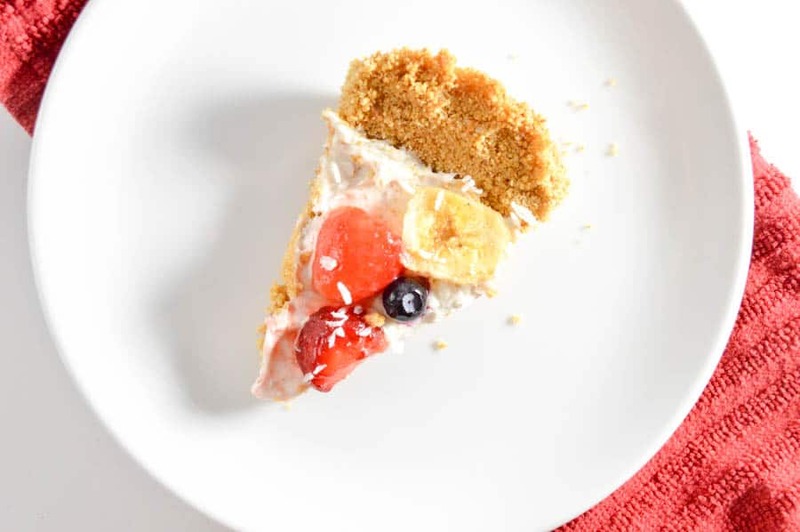 I once made a fruit pizza with a sugar cookie crust, but this spin sounds super tasty too! I like the idea of adding shredded coconut. Wow! What a fresh and delicious dessert idea! I love it. Thanks for sharing your recipe with us at Merry Monday this week! This looks so yummy. I have never had a dessert pizza, but I would love to try one. I love fruit pizza, but I haven’t made my own in forever. I need to try this recipe. That looks delicious! I love to make fruit pizza as a dessert when I make regular pizza for dinner. Thanks for sharing this recipe. I can’t wait to try it. I love Fruit Pizza!!! Thanks for sharing! Very cute and tasty looking! I know my family will love this! Stopping by from “You’re Gonna Love It Tuesday”! Thanks!! Sounds delicious! A hint of lemon juice in the glaze might be good too. YUMMY! I haven’t made a dessert pizza before although I love to eat them. I really like the crust in your recipe. Going to have to give this one a try.